This article is about a town in Libya. For other uses, see Sousa (disambiguation). 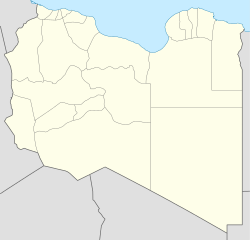 Susa or Soussa /ˈsuːsə/ (Greek: Ἀπολλωνία) (Arabic: سوسة‎) is a town and seaside resort in the District of Jabal al Akhdar in north-eastern Libya. Susa stands by the ruins of Apollonia, Cyrenaica. The town contains the Apollonia Museum. It is located about 30 km northeast of Bayda. The Ancient City of Apollonia in Cyrenaica was founded in 630 BC by Greek colonists and became a significant commercial centre in the southern Mediterranean. It served as the harbour of Cyrene, 20 km (12 mi) to the southwest. Apollonia became autonomous from Cyrene at latest by the time the area came within the power of Rome, when it was one of the five cities of the Libyan Pentapolis, growing in power until, in the 6th century A.D., it became the capital of the Roman province of Libya Superior or Libya Pentapolitana. The city became known as Sozusa, which explains the modern name of Marsa Susa or Susa, which grew up long after the cessation of urban life in the ancient city after the Arab invasion of AD 643. Sozusa was an episcopal see and is included in the Catholic Church's list of titular sees. ^ Balta, E., & Ölmez, M. (2011). Between religion and language: Turkish-speaking Christians, Jews and Greek-speaking Muslims and Catholics in the Ottoman Empire. İstanbul: Eren. Wikimedia Commons has media related to Susah. This Libya location article is a stub. You can help Wikipedia by expanding it. This page was last edited on 1 February 2019, at 12:41 (UTC).